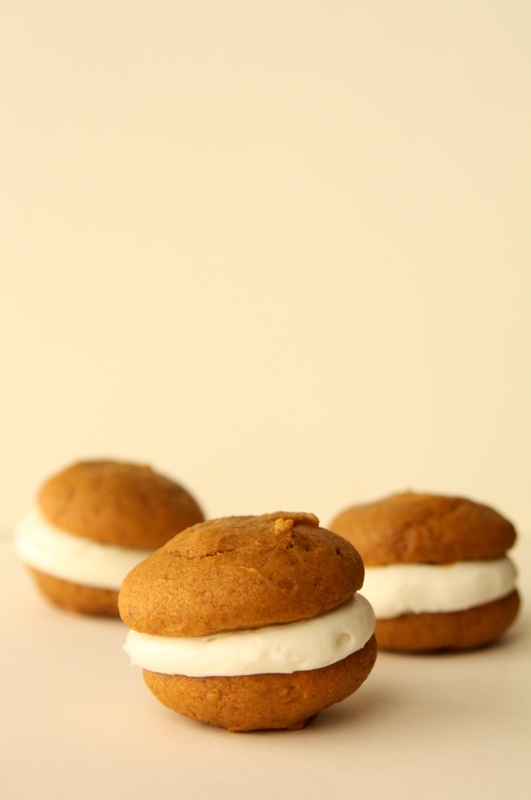 I am thinking this year, I might have to make whoopie pies a new Thanksgiving tradition. I love the pumpkin and cream cheese for fall …but just a little something different. Position a rack in the center of the oven and preheat the oven to 350 F. Line two baking sheets with parchment paper. Sift together flour, baking powder, baking soda, cinnamon, ginger, allspice, nutmeg and salt. In the bowl of a stand mixer fitted with paddle attachment, beat together the brown sugar and butter on low speed until combined. Add the pumpkins, then the egg, beating well. Add the vanilla and beat until combined. Add flour mixture and beat on low until incorporated, scraping down the sides of the bowl. I like to use a pastry bag for whoopies. Fill pastry bag with pumpkin batter, drop about 2 tablespoons of batter onto one of the prepared baking sheets and repeat, spacing them at least 2 inches apart. Bake one sheet at a time for about 15 minutes each, or until the cakes begin to crack and are firm to the touch. Let cool on the sheet for 5 minutes before transferring them to a cooling rack. Sandwich filling between two cakes and store in an air tight container. This entry was posted in Whoopies and tagged Cream Cheese, Pumpkin, Whoopie Pies. Bookmark the permalink.